This peaceful little fish is found in the rivers and lakes of India and Bangladesh. You should provide slow current and lots of open swimming area in your aquarium for this little guy. They should only be put in an established aquarium because they are very sensitive to changes in water quality. Provide tall plants for cover. Being Labyrinth Fish, Honey Gourami breath air. The surface of your aquarium water should be exposed to fresh air. This can be provided by leaving a couple inches between the water and hood. Using the bubbles from an airstone will also help air flow around the hood. Honey Gourami do very well in a peaceful community tank. You should not mix them with other types of Gourami because they may become aggressive or be aggressed by other species. Also, don't keep them with fin nippers or larger aggressive fish. They should be kept in small groups with one male and two or three females. This reduces aggression. Males have brighter colors than the females. They also have a bright orange throat area that becomes much brighter during spawning activity. Males also have longer and more pointed dorsal fins. Males will become aggressive toward other males when females are present. These little friends will go to the surface to gulp air periodically. They have a labyrinth organ and need to remove oxygen from the air to breath. Without access to fresh air, they will drown. 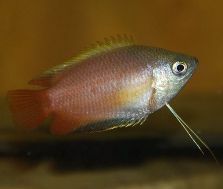 Honey Gourami will spend a large portion of the day grazing the bottom for bits of food and long algae growths. They do not eat enough algae to be helpful in controlling it, but plant matter is an important part of their diet. If your aquarium is completely algae free, be sure you have some plants for them to nibble on. If you want to breed Honey Gourami, you will need to keep the surface of your aquarium water as smooth as possible and provide floating plants. They are bubble nest builders and need those conditions to spawn. The male will build a beautiful bubble nest. You can tell if the female is ready to spawn when she has a fatter than normal belly. Males will be noticably more aggressive when they are ready to spawn. The male Honey Gourami will build his bubble nest just before spawning activity begins. He usually does this early in the day. After building the bubble nest, the male will court the female by swimming back and forth flaring his fins and raising his tail at her. The female responds by biting the male's back. He then brushes his back on her belly and they will begin to spawn in planted areas of the aquarium. Quivering signals that spawning is near completion. The female will lay hundreds of eggs. Once the eggs are laid, the female should be removed from the aquarium because the male will become aggressive toward her if she gets to close to the bubble nest. The male will maintain the eggs in the nest and spit water to herd them all together. The eggs will hatch in one to two days and the fry will start swimming four or five days later. Don't be alarmed to see the male scooping up the fry with his mouth. He is just taking them back to the nesting area for security. The fry should be fed baby brine shrimp and curshed flake food. Excellent water quality is important at this stage and frequent water changes should be done. The fry will grow quickly and you should keep the water temperature at the upper limit of the above range until they are juveniles. Keep the water level close to your hood. The fry need a layer of moist air for their labyrinth organs to develop correctly. For more information, go to Wikipedia's Honey Gourami page.